To start, go to Cells to Self located near the Bay end of the museum. Find the yellow intro panel that says CELLS TO SELF in large letters. Turn right, toward the Bay windows at the far end of the corridor. Walk past the large plywood wall on your left. Head toward the tall wall structure in the middle of the corridor. On the left side of this structure, find the platform with the two footprints. Step on the platform and follow the instructions. When you get to the screen that shows how many red blood cells you have, take a photograph of that number. When you’re finished with the exhibit, have someone else try it and compare your number to theirs. How do you think the exhibit calculates this number? Your blood cells are manufactured in your bone marrow. There, blood stem cells divide and change until they become red blood cells, platelets, or white blood cells. Red blood cells supply oxygen to your entire body, so the bigger you are, the more red cells you need. 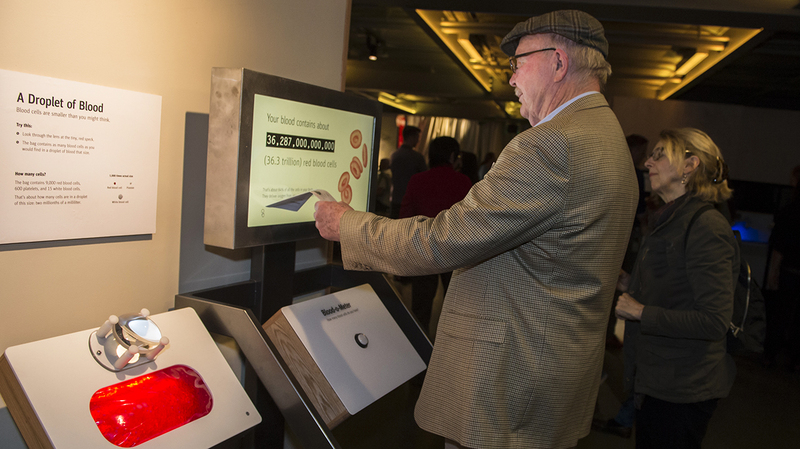 That’s why this exhibit measures your weight to estimate your number of red cells. Walk to your left around the corner of the wall structure. Have you ever seen your pulse? 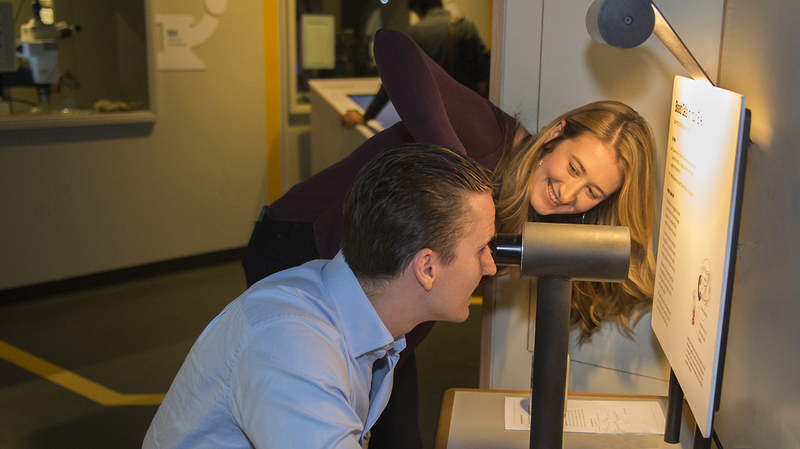 Follow the exhibit instructions to see your blood cells moving through the vessels in your eye, and notice that they pulse in time with your heartbeat. Set your phone’s timer to one minute, then watch the cells and count the number of pulses in a minute. You just directly observed your own heart rate, also known as your pulse. If you want to see it go faster, do a few jumping jacks and then count again. Turn to your left and find the three yellow lines on the floor coming out from the wall. Walk along the wall to the fourth line, which has a pedestal next to it. Stand in front of the handles at the pedestal. You can also track your heart rate by watching as it makes heart cells beat under a microscope. 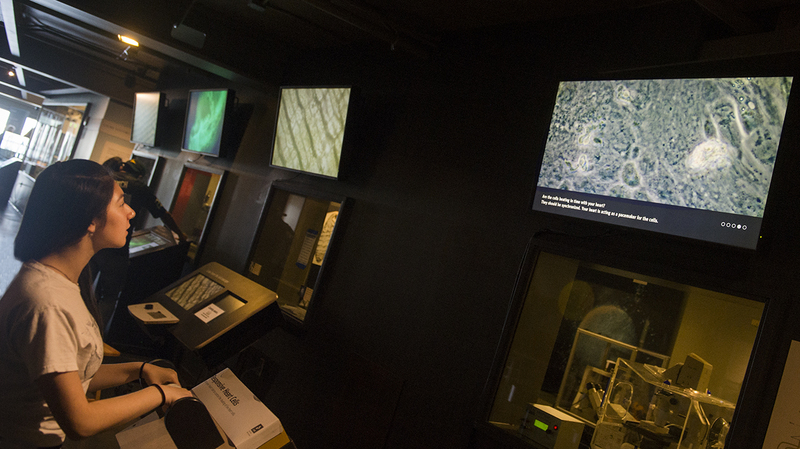 Follow the Responsive Heart Cells exhibit instructions to use your pulse to control the beating of human heart cells. Have a friend take a video of the cells on the screen beating in time with your heart. A heart cell is actually a kind of muscle cell, called a cardiac myocyte. (Literally, a heart muscle cell.) The muscle fibers in a heart cell contract in response to an electrical stimulus from a neighboring cell. The contraction moves through the heart cells in a wave, with one cell transferring the pulse to its neighbors in a fraction of a second. Look just to the right and find the free-standing panel with black flaps. You (and every other living thing) began life as a single cell. And in those early days in your mother’s womb, you didn’t look very human at all. 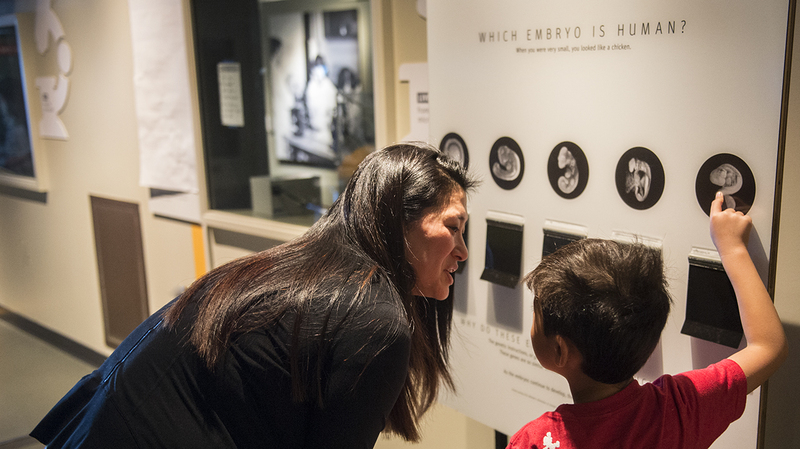 At this exhibit, take a selfie with whichever embryo you think looks most like you at that stage. Now check to see if you were right. The bizarre similarity of these early embryos hints at the fact that humans and all other animals evolved over millions of years from the same animal ancestors. The differences between you and a dog happen because of rather small differences in the timing and location of chemical signals that guide developing cells. That’s why you have arms and legs instead of paws.